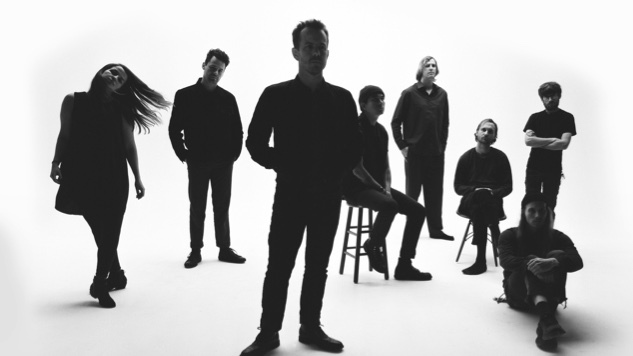 Typhoon Announce New Album Offerings, Share First Movement "Floodplains"
“I wanted this record to be a journey, like Dante’s Inferno. It kicks off with ‘Wake,’ where the character wakes up and he’s shitting the bed and doesn’t know what’s going on. I was going for a specific feel that Samuel Beckett does so well,” said singer/songwriter Kyle Morton in a statement, referencing Beckett’s Three Novels. Offerings offers four total movements (“Floodplains,” “Flood,” “Reckoning” and “Afterparty”) to represent the mental phases the mysterious main character goes through: He realizes that something is amiss, struggles through chaos and accepts before facing fate. Themes of memory and loss run amok, backed by the whirlwind of horns and a sense of impending doom continued from 2013’s White Lighter.